Rihanna performed a second Diamonds World Tour show at the Venetian Macau on September 14. Once again she wore menswear but this time around it was Kokon To Zai. 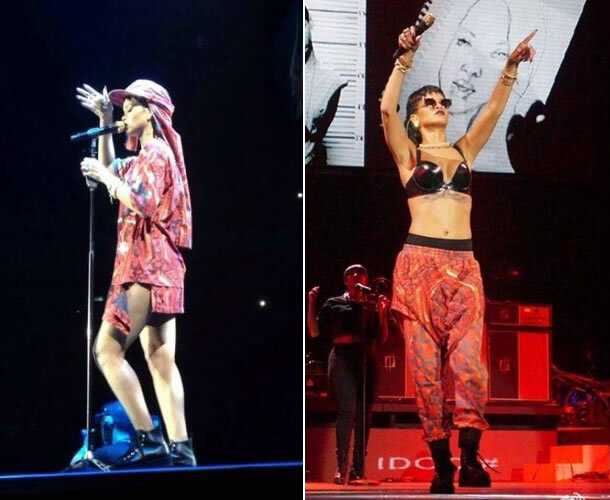 Rih wore a red outfit with a blue and yellow all-over print from KTZ’s Spring/Summer 2014 menswear collection. The ensemble included a hat, oversized shirt and sweatpants. Click here to view the outfit post on DWT Macau Day 1.